HGTV's 2010 Dream Home is a gorgeous, $1.5 million dollar home set in the desert of New Mexico. The 3,900 square foot Dream Home features three bedrooms, two baths, and a separate guest house with its own bathroom. The Dream Home also has a three-car garage, a home office, and a playhouse just for kids. 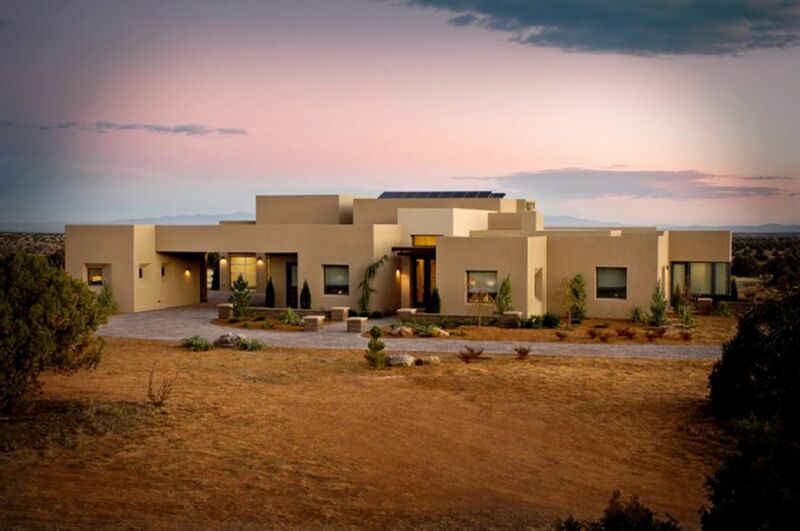 These photos and their descriptions highlight the unique features of the HGTV Dream Home 2010, a contemporary Pueblo home. You'll see how the Dream Home takes full advantage of the desert and mountains surrounding it, and how it uses local talent to pay homage to its Southwestern location. Click on each of the Dream Home photos below to see the picture in greater detail and to read more about the special features of each area of the house. This photo shows the beautiful Adobe-style HGTV Dream Home in Sandia Park, New Mexico, surrounded by the setting sun. Scroll below the photo for more details. The 2010 HGTV Dream Home is inspired by its New Mexican setting. It was designed in a contemporary Pueblo style, and it has pops of turquoise in every room. The sprawling 3,900-square-foot home is all on one level, ideal for anyone who has trouble with steps. Every room except the home theater room features huge windows to take full advantage of the wide-open skies and desert and mountain vistas which surround the home. As in previous years, the 2010 Dream Home is designed to entertain. This year's Dream Home achieves this goal with an open floor plan that makes it easy for guests to mingle, a huge kitchen designed for cooking for crowds, an outdoor dining area with a built-in grill and fireplace, and areas for cozy conversation. Read on to learn more about the different areas of the 2010 HGTV Dream Home. The entryway of the 2010 HGTV Dream Home in Sandia Park, NM, with comfortable wing chairs and tile-encased fireplace. Details below the picture. As you enter the 2010 HGTV Dream Home, you are met by a cozy seating area designed for intimate conversation. Two plush wing-backed chairs flank a fireplace encased by turquoise tile created by a local artisan. From the entryway, you can see the hardwood floors and high, rough-pine ceilings that run throughout the Dream Home. Just behind the fireplace of the entryway is the Dream Home's home theater. The dining room is to the left, while the great room with its stunning views is straight ahead. See the next photo for more details about the HGTV Dream Home 2010. The beautiful furniture and stunning views that can be found in the Great Room of the Sandia Park, New Mexico Dream Home. Details below the photo. The great room of the 2010 HGTV Dream Home was designed to take full advantage of the open skies and stunning mountain vistas surrounding the home. The room features 16-foot ceilings paneled in rough pine wood and beautiful hardwood flooring. Enormous windows cover two of the walls of the room, bringing the gorgeous views right into the great room. Sofas and plush ottomans provide seating for 10 - 15 people. The seating is low to avoid blocking the views from other areas of the home. The great room of the Dream Home is open to the kitchen, so guests can mingle from one area to the other. The entry hall is just behind the great room, while the outdoor dining area and patio are just on the other side of the windows. See the other pictures for more details of the 2010 HGTV Dream Home. The HGTV Dream Home in Sandia Park, New Mexico has a media room that will make you feel like you're at the movies. Details below the picture. The 2010 HGTV Dream Home has a media room that gives you the feel of being in a luxurious private theater inside your very own home. The home theater features a huge flat-screen TV set atop a piece of furniture with plenty of room for storage of DVDs and games. The home theater is nestled in the center of the house, and it's the only room in the Dream Home with no windows. It features cork-lined walls to prevent the sound of the television from permeating the rest of the house. The viewers in the home theater can choose to sit on chaise lounges or love seats. Recessed movie-theater style lighting guides latecomers to their seats without having to turn on the main lights. A large table in the center of the room is actually made up of four smaller tables that can be separated to provide individual places to rest popcorn and drinks. Two old-fashioned movie set lights provide atmosphere. The home theater is located on the other side of the fireplace from the entry hall, directly in the center of the Dream Home. See the next photo for more Dream Home details. If you have a home business or just want a quiet private study, the HGTV Dream Home 2010's home office provides a perfect setting. Details below the picture. The home office of the HGTV Dream Home 2010 is located toward the front of the home, which means that you can easily see customers or clients pulling up while you're working. There are two separate outdoor entrances, or you can get to it from the dining room or entry hall. The Dream Home's home office is a spacious room that forgoes a traditional desk for a large dining room table, giving you room to spread out and work in peace. Shelves provide lots of storage for papers and office supplies, and the walls are decorated with striking artwork with a New Mexico theme from local artisans. You can enter the Dream Home's home office from the front of the house or the motor court, or from inside the house from the entry hall. See the next photo for more details about the 2010 Dream Home. The 2010 HGTV Dream Home kitchen, featuring a beautiful tiled wall and chef's quality appliances is perfect for entertaining at home. Details below the picture. The kitchen of the HGTV Dream Home in Sandia Park, NM is designed to make entertaining a breeze. The most dramatic aspect of the Dream Home kitchen is a floor-to-ceiling tile wall that serves as a back splash and as a focal point. The tiles were hand-crafted by local artisans. The kitchen also features a massive black-granite island with seating, perfect for a quick family breakfast or for setting out a buffet for friends. The appliances of the Dream Home's kitchen make cooking simple, with a multi-level oven, a gas and induction stove with a professional-quality hood, a steamer tray, and a pair of matched refrigerators to provide plenty of storage room. The kitchen leads to the dining room via the walk-through pantry and to a recycling room with plenty of storage for dry goods and recycling bins. The kitchen is also open to the great room, taking advantage of its stunning views. See the next photo for more details about the HGTV Dream Home 2010. The 2010 HGTV Dream Home features a huge pantry that separates the kitchen and the dining room. See the pantry and its special features for yourself. If the large open kitchen in the 2010 HGTV Dream Home doesn't provide enough room for you when you're entertaining, never fear. The huge walk-through butler's pantry gives you additional prep and storage space so that you'll never run out. Conveniently located between the kitchen and the dining room, the butler's pantry features a wine storage system and cooled drawers that can hold additional refrigerated or frozen goods, in case the two refrigerators in the kitchen are overflowing. There's also a separate sink in the pantry, which means that you can stow dirty dishes there after dinner without them being visible from the other rooms of the Dream Home. Additional counter space and beautiful oak cabinets round out the features of the walk-through pantry in the Sandia Park Dream Home. See the next photo for more details about the 2010 HGTV Dream Home. HGTV's Dream Home designers put special effort into making the master bedroom of this gorgeous home unique. Details below the photo. Although the 2010 HGTV Dream Home is designed for entertaining friends and family, sometimes it's good to get away. The master bedroom of the home creates an island of peace and quiet just for the owners. The Dream Home's master bedroom is set in its own wing on the back side of the home. Sage-colored walls set against rough-pine paneled ceilings give the room a tranquil atmosphere. Huge windows that stretch nearly the length of the walls provide gorgeous views over the mountains. The decor of the Dream Home's master bedroom mixes masculine and feminine influences for a result that any couple will be pleased with. A good example is the pair of matched chandeliers which provide lighting on either side of the bed. While the lines of the metal chandeliers seem masculine, they also have feminine elements like crystal accents. Sliding glass barn doors separate the master bedroom from the luxurious master bath. The bedroom leads into a sunrise room, where the Dream Home's owner can lounge and read a book or watch the sun come up over the mountains. Of course, no perfect master bedroom would be complete without a fireplace. The Dream Home features a see-through fireplace set into the wall that separates the bedroom from the sunrise room, so that you can enjoy the flickering flames from either side. For more details about the 2010 Dream Home, see the next photo. The master bedroom of the HGTV Dream Home in Sandia Park, New Mexico will make you feel like you're living in a luxurious hotel. Details below the photo. The master bathroom of the HGTV Dream Home 2010 is a study in luxury. In the center of the room is an enormous bathtub, where you can soak away your daily cares with a long candlelit bubble bath. No room in the Dream Home is complete without stunning vistas, and the master bath is no exception. You can slide open the sliding glass barn doors to take full advantage of the broad windows in the master bedroom. If you don't have the time or inclination to soak, you can also enjoy the glass-enclosed shower, which features its own window. A rainwater shower head and body sprays makes showering feel totally luxurious. After you step out of your bath or shower, you can wrap yourself in warmth with a towel fresh from the warming drawer. For more details about the HGTV Dream Home 2010, see the next photo. Whether you have kids yourself or expect them to visit, the kids' bedroom of the 2010 Dream Home will make children feel at home. Details below the photo. Situated at the back of the 2010 HGTV Dream Home on the opposite side of the house from the master bedroom, the kids' bedroom is especially designed to delight children. The walls in this bedroom are painted a tranquil blue color, but orange bedding and accents add energy and interest to the room. The kids' bedroom is designed for fun, using toys as artwork as well as entertainment. Wooden pull toys brighten up the walls, while a huge basket full of blocks looks really cool, while providing joy for younger kids. There's also a big toy chest and playful accents like a rope lariat and pictures from the Disney movie, Toy Story. A wooden dresser provides storage for clothes. Atop of it sits a hideaway upper cabinet which can enclose a television set. The kids' bedroom has two entrances, one from the entry hall and one from the Jack and Jill bathroom that it shares with the guest room. For more details about the HGTV Dream Home 2010, see the next photo. The guest bedroom of the HGTV Dream Home 2010 uses exquisite design to make your guests feel right at home. Details below the photo. From the soft lavender wall color that was inspired by the New Mexico sunset to the careful choice of accents like pressed tin mirrors, the guest bedroom of the 2010 HGTV Dream Home was crafted to make your guests feel right at home. The guest bedroom features luxurious bedding and comfy chocolate-colored pillows. Accents are done in white and silver, including the silvery mirror frames and wall sconces and the white bedside table. A comfortable chair and ottoman give your guests a place to read or relax. The guest bedroom shares the Jack and Jill Bathroom with the kids' bedroom. You can reach it through the main entry hall. For more details about the 2010 HGTV Dream Home, see the next photo. A dream for any traveler, the 2010 HGV Dream Home includes a casita, a small separate guest house. Details below the photo. One of my favorite features of the 2010 HGTV Dream Home is the casita - a small guest house that's separate from the rest of the Home. Guests will love having this private getaway, which features a bedroom, a bath, and even their own private patio and outdoor fireplace. The casita is located just across the motor court. Although it feels private and secluded, it's only steps away from the main house. One of the most striking elements of the 2010 Dream Home's casita is the floor-to-ceiling tile wall that stretches from the bathroom to the bedroom. The bright tiles in Southwestern shades of reds, oranges, and blues are hand-crafted by a local artisan. The bedroom section includes a flat-panel TV on a swinging arm and a comfortable Darby chair. Huge sliding glass doors with sunset views lead out to the private patio, which has outdoor chaise-lounge seating and a see-through fireplace. The casita also has its own bathroom, separated from the bedroom by a glass-enclosed shower. You can get to the casita from the front motor court or through the glass doors from the private patio. The gorgeous back patio of the 2010 HGTV Dream Home features easy entertaining and spectacular views. Details below the photo. Once you start entertaining on the back patio of the 2010 HGTV Dream Home in Sandia Park, NM, you may not want to go inside again. The back patio features several different outdoor seating arrangements, to make it comfortable to gather in groups. A gas grill makes outdoor cooking easy, and seating around the grill lets guests hang out with the chef. Meanwhile, an outdoor fireplace provides warmth on cool desert nights, as well as a gathering point for guests. The outdoor area of the Dream Home is carefully landscaped and designed, with features like interesting boulders brought from nearby gold mines and towering desert rocks. The back patio looks out over the desert and the distant mountains, providing views that shouldn't be missed. From the back patio, you can enter the house through the great room or the three-car garage. A playhouse for kids is also nearby. For more details about the 2010 HGTV Dream Home, see the first photo in this gallery.